Effect: Each time your opponent’s Monster Cards are sent to the Graveyard, inflict 300 points of Direct Damage to your opponent’s Life Points. Okay... Yet another card that is extremely vulnerable to Mystical Space Typhoon, Heavy Storm, Harpie's Feather Duster and of course, Jinzo. If I was so bent on dealing Direct Damage through a Trap card I would much rather use Magic Cylinder and Ring of Destruction. It takes awhile for 300 points of Direct Damage to add up. And during that "while", it will most likely be destroyed or negated by one of the four cards mentioned above. 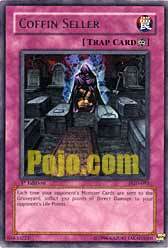 Although, if you're playing a _casual_ Direct Damage based deck, you could use some silly combos with Coffin Seller. Some of which may win you the game. But don't expect the same results to come from a competitive tournament. Don't expect me to discuss the sub par combos you can pull off with Coffin Seller. Why's that? I'm a competitive tournament player, I usually don't have the time for casual games and below average combos. Abacus(500), which do almost the same thing but the one thing that makes Coffin Seller better is that it only effects the opponent. Abacus may do 200 more damage but that’s still 500 damage to you, and it's a very bad drawing. So obviously this is for Burner Deck, but I've already seen somebody play it in a Beatdown Against me, it only lasted long enough to hit me 2, so it didn't really matter too much. Though if you do play allot of Monster removal then it can lightly speed up the opponents’ lack of life. But it still isn't powerful enough to be a very used tournament deck, but if somebody gets some good gameplay out of it than it may not end up being cut-up to use the picture on another card. ArtWork: 4.5 - I think Coffin Seller looks awesome they should have given the picture to a better card, or if they just made it something like 800 or more damage then it would be worthy. Each time your opponent's Monster Cards are sent to the Graveyard, inflict 300 points of Direct Damage to your opponent's Life Points. Skull Invitation anyone? That's what I thought this was when I first read it. The effect is similar but not quite. Unlike Skull Invitation, this only affects your opponent. However, it only applies to monster cards. Like Skull Invitation, I would assume this means if they're sent from the hand, field or deck the effect would trigger. 300 damage per monster card isn't much damage but it can add up pretty quickly with the right situation. All the mass monster removals (Dark Hole, Raigeki, Torrential Tribute, Mirror Force etc), Royal Tribute (in a Gravekeeper deck) and Card Destruction can cause some nice damage. This also works well with Dark Room of Nightmare. If your opponent has an active Mirage of Nightmare with no Mystical Space Typhoon handy, this will make them pay for thinning their deck. The most fun though is when your opponent uses Painful Choice and tries to dump a bunch of Exodia parts into the graveyard. Most other situations don't really add up to much damage. I find that pecking away like this to be ineffective and rarely makes enough of an impact on the outcome of the duel since this card won't live very long. Cards like Banisher of the Light and similar ones that send cards directly out of play will break this card. This is a pretty mediocre card. Most people don't run that many monsters in their deck so you won't get a huge benefit from this without using Fiber Jar over and over. There are better burner cards to make room for.